Raising a pig is harder than it looks. I’m exhausted already and we are months away from getting piglets! First, you have to schedule an appointment for a slaughter date. Really? I have to schedule an appointment for pigs I don’t have yet? Yes, that is right. I stumbled upon this information, of course. I actually only called West Gardiner Beef to inquire about pricing for processing a pig. That’s when I was told if I was planning on processing pigs, I needed to set up an appointment and that that 1st available one was December 27th What? It’s only the middle of January. I took the date right then and there. Now, I have to find pigs. It shouldn’t be that hard. Can’t I just order them from the local feed store? Nope. At least the nice man at the feed store gave me the name of a local farm. Stacy suggested that I contact Keena at our CSA, Little Ridge Farm. Keena was a wonderful resource. She gave me the name of a website with a list of pig farmers in Maine – Maine Pork Producers Association and wonderful advice. Actually, her CSA website is quite informative about pigs as well. Another friend actually asked her brother for some leads, so I’ve added those names to the list. I have spent countless hours on the phone with some of the local pig farmers. 1. Schedule a slaughter appointment almost a year in advance. 2. Calculate when you should get your pigs. The longer you have them, the more money you sink into them on feed. 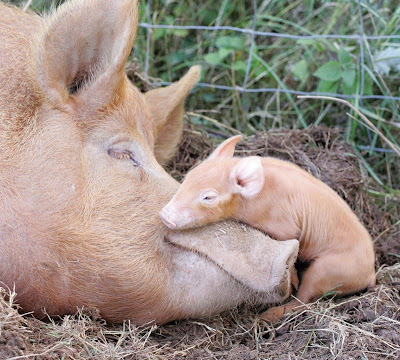 From what I gather, pigs should be about 6 months old when they go to slaughter. With a slaughter date of the end of December, that means I want piglets born in June. I’ve learned that piglets are usually available for purchase when they are about 8 weeks old, so now I need to make sure I have my piglets sometime in August. At least I have plenty of time to get ready for these piglets. Oh, I mean, Ward and Wade have plenty of time to build a home for the pigs. 3. Feed prices are increasing. What isn’t increasing? I’m still researching all of the other details, such as best way to feed the pigs and how to make sure we have plenty of water for them because they knock over just about everything. Ward also needs to figure out how he’s going to get these 200 to 250 lb pigs to West Gardiner! Good luck with that, honey. I really hope this pig venture works out. It’s been challenging to lay the groundwork. Chickens were so much easier. When I ordered the chickens, I went online, found a site that seemed reputable and ordered them. In a month they were delivered to my house. It was that easy. More on raising chickens another time!